The wait is over! J.C. Newman's solid and affordable Quorum cigar is now available in a deliciously dark Maduro wrapper leaf. 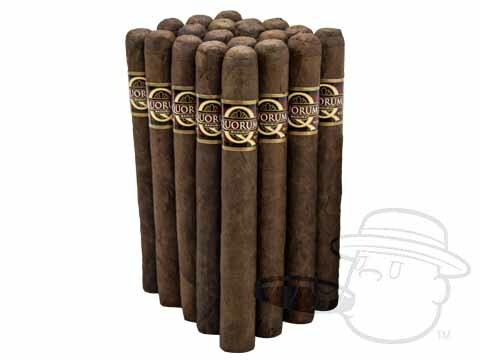 Expect the same high quality smoke at an awesome price, this time with a hearty taste of the rich and sweet maduro character you crave.Quorum Corona Maduro is a medium bodied smoke with smooth tones of cocoa, cedar, and more in a traditional 5 1/2 x 43 Corona vitola. I love this cigar as my everyday smoke. My everyday, mid-day cigar. Best performing cigar for the price on the market. My go-to good cigar when not enjoying a higher-priced item. Always come safe secure and in good shape with awesome flavor. Don't like that the price went up from the first time I bought it seems maybe on purpose? Quorum Corona Maduro is rated 3.7 out of 5 based on 13 customer ratings.